Round 2 of the 2012 CIK FIA U18 World Championship and Academy trophy (U15), just came to an end on Sunday August 26, under sunny skies on the Circuit Gabriel Thirouin, in Angerville, France. 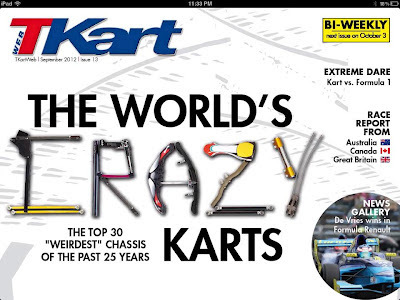 The CIK FIA was back home to celebrate their 50 years anniversary. It took American driver Tazio Torregiani no time to learn the track. Each practice session on Friday he progressively kept getting better and faster.On Saturday morning, the day started with a wet track, but by the time it was the academy drivers turn to go out, the track was dry. Torregiani went out for morning warm up practice, and was able to put it all together. He was the fastest driver for most of the session and finished 7th fastest at the flag. In qualifying Tazio was on a charge, and his times were dropping lap after lap, but with just two to go, his Fim KF3 motor started cutting out coming out of the turns, so by the end he qualified 17th. The Parolin mechanics checked the motor and changed Tazio's carburetor. Just when the problem seemed to be solved, Tazio's worst nightmare became real. In the warm up lap of his first of three heat races, his engine would dye before the start with what seemed an electrical problem. In the second and third heat races, Tazio drove better than ever and finished 13th and 14th respectively. All he needed was to finish his first heat race in 14th place to make the final A races, but his engine let him down. This meant he would race in the Final B race. "With a fly by of the French Air Force and a running of historic karts before the finals, It was finally time for my final B. I started 9th, made my way up to 4th with an aggressive start, gained speed, lost a bit, and eventually finished 6th in the race. Overall it was a great learning experience" Said 13 year old Torregiani after his Final race. 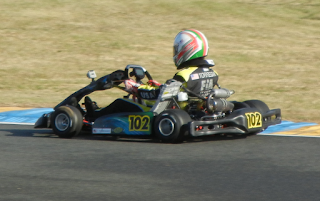 The second round of the 2012 CIK FIA Karting Academy trophy, in Angerville France, just came to an end this past weekend. It was an incredible experience. The track was beautiful and in great conditions. It took Tazio no time to learn the circuit. Each practice session on Friday he progressively kept getting better and faster. On Saturday morning the day started with a wet track, but by the time it was the academy drivers turn to go out, the track was dry. Tazio went out for morning warm up practice, and was able to put it all together. He was the fastest driver for most of the session and was driving great, his pace fell off a bit in the final laps but was still 7th fastest in the morning warm up. In qualifying Tazio was on a charge, and his times were dropping lap after lap, but with just two to go, his Fim KF3 motor started cutting out coming out of the turns, so by the end he qualified 17th in his group. The Parolin mechanics checked their motor and changed Tazio's carburetor. Just when we thought we had the problem solved, Tazio's worst nightmare became real. In the warm up lap of his first of three heat races, his engine would dye before the start with what seemed an electrical problem. This pretty much decided our weekend. In the second and third heat races, Tazio drove better than ever and finished 13th and 14th respectively. All he needed was to finish his first heat race in 14th place to make the final A races, but his engine let him down. This meant he would race in the Final B race. He started 9th out of 15 drivers and got a great start, started attacking and climbed up to 4th. Just as he was catching third place, he went a little two wide coming out of turn 2 leaving his door open, which allowed two drivers to dive in. Tazio finished his final in 6th place. The best part was that his fastest lap in the race of 53.6 was fast enough to finish in the top 10 of the final A races, and it was clear that this is where he belonged. Not only was Tazio fast on the track, but he was also fast in the Edukart test, where he answered all 25 questions correct, and finished 4th fastest out of all Academy drivers, missing out on the Edukart podium by one position. After two rounds of the Academy Trophy, you can really tell how much Tazio is learning from it, he is really coming in as a driver and you can notice his confidence growing on the track.
" I was able to stay with the leader, and several laps later, coming onto the straight he made the smallest of mistakes which gave me just a good enough run to make the move and pull away" Tazio said later after the race. Never putting a foot wrong he regained first place and took the win. Tazio drove a memorable race, but couldn't have done it without his younger 12 year old brother Dario, who is the mechanic apprentice. Dario for the first time was alone without his dad who had to work, but still managed to look after Tazio's kart all the way to first place. On Sunday Tazio won the prefinal race and finished second in the final, coming home with two podium Regional results including a win. Next race is the fourth round of the WKA Man Cup National in Norway IL. Tazio has never seen this track before, but he's hoping to learn it quickly on the first round of practice, in the first weekend of August. Tazio and his team would like to thank everyone that helped him over the weekend. For more info go to www.TazioRacing.com, brought to you by www.NewCountryPorsche.com. Recently last weekend I completed the first round FIA Academy Trophy. It was such an experience to drive with and on such a different track, kart, drivers, conditions and rules. The tracks in Europe I've noticed have no elevation or very long straights just sweeping turns followed by corners or a heavy braking hairpin, unlike in the US where the turns are flat out followed by a straight and there's elevation on every single track you go too. The motors and chassis they have in the under 18 world championship are all very unseen in the US like the Art Kart, MS chassis or even a Zanardi surprisingly, there were no big teams or chassis manufacturers like Tony Kart, Birel or CRG in that series. Everybody uses the same up to specs KF3 motor in the Academy and U18 championships. The drivers aren't just some local racers going to a big time race just to see what's it like. They are the best in the world from each country, no one makes mistakes they drive clean, professionally and aggressive, they aren't reckless. Weather is about the same but track conditions are much different, the track gets extremely sticky within 4 practice sessions and is difficult for lots of people if you don't know what your doing with the setup. When I say rules I mean procedures, how things run, standards. There's a driver's presentation where all the driver's come to the front stretch represent their country take photos and shake hands with some of the steward's and marshals which was very cool. Each and every qualifying session is 8 minutes. There are 3 heats just like the SKUSA Supernational' they add up your finishes and decide whether you made it to the final or not. Only 28 drivers make it to the main "A" Final. Starting lights as the green flag and you must stay in your racing line until the lights go off or you get a penalty of 3 to 10 seconds depending on how much of your kart was out of the lane. If you don't make it to the "A" final there's a "B" final which gives less points though. After qualifying and each heat race you must take off the wheels you have used and your race fuel to a holding station then before the race starts again you put them back on, and the cycle starts all over again till Sunday. Sunday one warm up session takes place then the Finals and the day is over with a massive podium presentation, which goes on with sparkling water, spectacular trophies and national anthems. Followed by press conferences and media. The second and third heats were not as good and Tazio couldn't manage better than 17th and 19th, which meant that after all the results were added, Tazio was outside the top 28, and outside the Final A (the main final). This meant that he would race in Final B. He started in 8th out of 19, had a bad start and dropped to 11th, but came back to finish 8th. The drivers that were really on top form were mostly European drivers that are currently competing in all major KF3 European championship. There is no questions that this crop of drivers are among the best 13 to 15 year old drivers in the world. They were all very fast and made no mistakes. To race among them was an incredible experience. The next race is in France next month we are hoping for a better result. 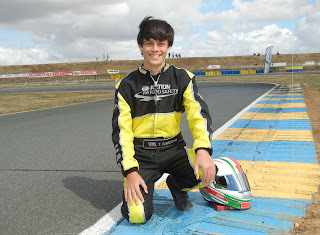 13 year old American driver, Tazio Torregiani, from Stamford CT, is entered to race in the 2012 CIK-FIA Karting Academy Trophy. Torregiani will be the only driver to represent USA in this prestigious and multicultural competition. " I'm very excited to be racing with some of the best drivers all over the world, it's a great opportunity for me to continue my racing dreams" said Tazio. The Academy Trophy is the supporting series to the CIK-FIA U18 World Championship. It resembles very much a Nations Cup, and is for 50 karters between 13 and 15 years of age, each from a different country. Equal Parolin Fim-KF3 karts will be granted by drawing lots to the Drivers and placed at their disposal free of charge. The competition will be divided in three rounds; Portugal July 8-10, France August 24-26, and a night race in Bahrain November 8-10. Each adopting the usual format of practice, qualifying and two finals, and integrating the educational program "EduKart" focused on safety, the knowledge of the regulations, the anti-doping rules and the code of conduct on circuits. Torregiani is set to leave for Friuli-Venezia in Italy on Wednesday May 30 for official testing before the first round in Portugal. 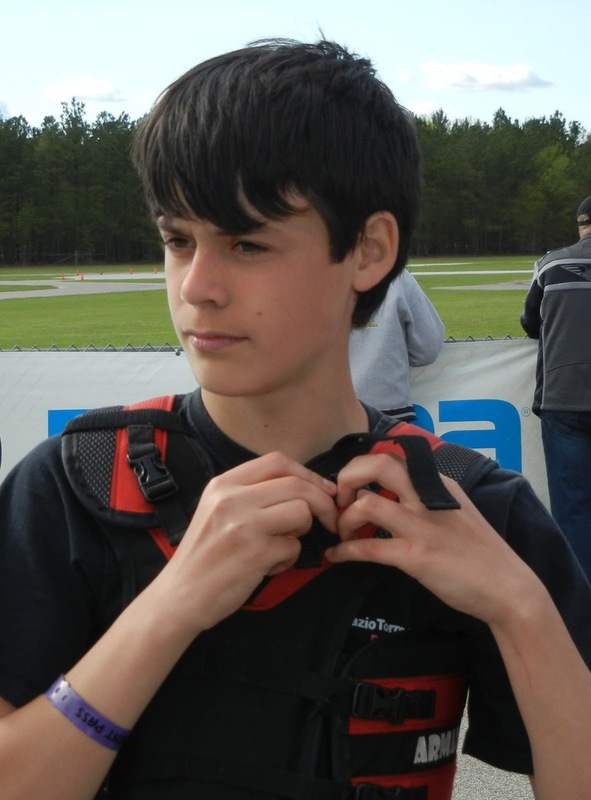 Young Tazio has been racing since age 6 under the wing of Mike Doty Racing, and is the 2007 OVRP Novice Cadet Champion. The CT karter has been racing with the best drivers in North America in the WKA Manufacturers Cup Nationals, and the SKUSA Supernationals in Las Vegas, where in 2011, he was one of the fastest cadets. 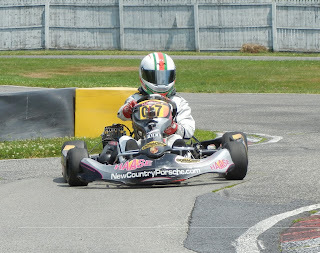 In 2011 Torregiani won 9 times, including 6 WKA divisional races, and finished second overall in the WKA NJ Sprint Series. 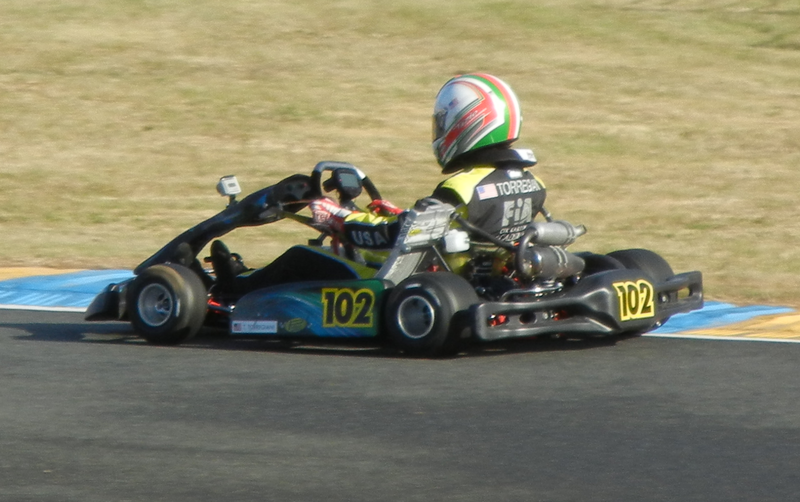 For 2012 Tazio moved up to the junior class and is already lapping as fast as the best, running at the front in the Raceway Park Karting Series, already with one win on his name. For more info please visit www.TazioRacing.com. 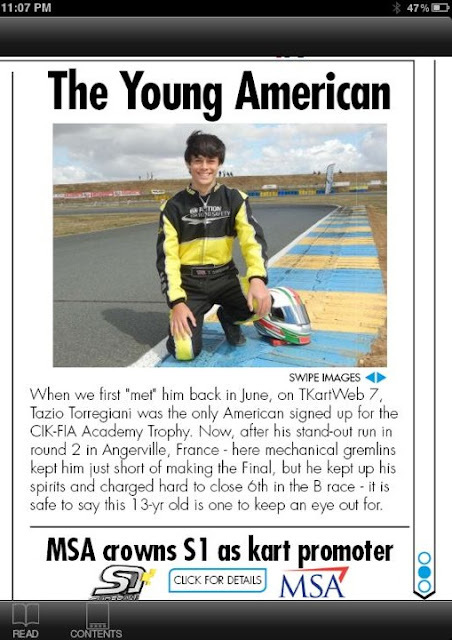 13 Year old Tazio Torregiani makes the paper again, this time in the Stamford Advocate. Following you'll see the article as it appeared on the first page of the Sports section of Sunday's paper of January 29th. The article was also on their website. Special thanks to Sports writer Rich DePreta and the Stamford Advocate. You can also click HERE to see the actual article on the web. STAMFORD -- One of the wonders of youth is having dreams of the future. Tazio Torregiani is well on his way of turning his dream into reality. The 13-year-old 7th grade student at Dolan Middle School in Stamford has been Go-Kart racing since age 6 and has graduated from Cadet class to Junior Class on the National racing circuit. "It's fun. But I love the competition and challenge of racing," Tazio Torregiani said. "When I'm on the track, I love the speed and I love the feeling behind the wheel. When I hit the gas, the whole world goes away." 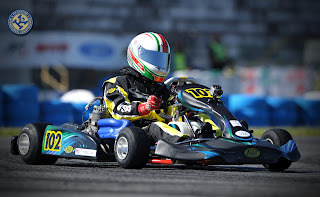 And when Torregiani jumps back into his Sprint Go-Kart (Junior Class, ages 13-15, speeds of 70-75 mph) this spring, he will be driving at Englishtown, N.J., Daytona (Fla.) Speedway and even the street track circuit in Las Vegas. "The Junior Class Regional Championship is a five-race series. 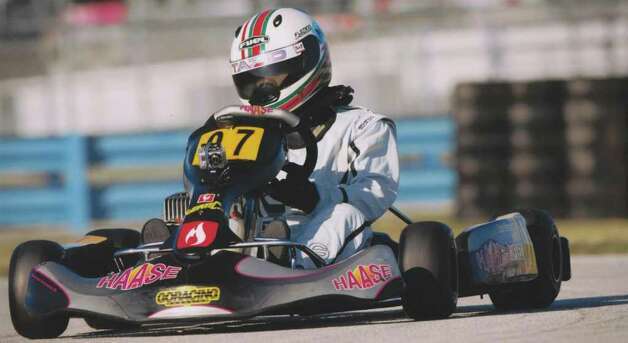 The World Karting Association Manufacturers National Cup is a six-race series," said Tazio's Dad, Patrizio Torregiani. "The Super Nationals are in November in Las Vegas. Tazio could race as much as three weekends out of every month once the warm weather returns to the Northeast." Torregiani closed out his Cadet Class (age 8-12) racing career in grand style with impressive outings in Las Vegas last November and Daytona last December facing drivers from across the country and across the globe. Torregiani is quickly becoming a brand. He has a website (visit www.NewCountryPorsche.com to access TazioRacing.com). Torregiani is on Facebook. Torregiani has product sponsors. He has Doug Fleming in charge of his racing engines. But most important of all, there is his father, Patrizio Torregiani. Patrizio Torregiani has been a Porsche Certified Sales Specialist at New Country Porsche of Greenwich for 13 years. "When I was growing up in Italy, my dad was a big Formula One racing fan. I had the dream to race. But not the opportunity," Patrizio Torregiani said. "My wife (Lucia) and I named Tazio after Tazio Nuvolari. He was a great Grand Prix race driver in Italy in the 1930s. When Tazio showed interest in Go-Kart driving, I wanted to give him the opportunity." Tazio Torregiani remembers his first brush with racing like it was yesterday. "I was age 6 and our family was in Portugal on vacation. We all went to the local go-kart driving place and everybody rode," Torregiani recounted. "I was thrilled with how fast the laps were. The track owner said to my dad after we finished `You should get your son a cart.' "
It was in Cuddybackville, N.Y. near Middletown and Wappinger Falls that Torregiani began racing and eventually came under the tutelage of Mike Doty, a multiple National Karting Champion. Doty remains Torregiani's coach today with Torregiani driving under the banner of Mike Doty Racing. As one might expect, Tazio Torregiani's racing dream/career has become a family affair. His father is the marketing specialist. Lucia, his mother, is the logistics expert for the weekend trips to Englishtown, N.J. and beyond as well as the long adventures to Las Vegas and Daytona. Younger brother Dario (age 11) is a mechanic who works with the pit crew during races. "We're fortunate that Mom is on board 100 percent with this," Patrizio Torregiani said. "We can't do this without the whole family taking part." The first priority for 2012 is to find some national sponsors. The second priority is to keep racing and draw the attention of the young driver academys that Ferrari and Porsche among others run with an eye toward developing the next Formula One star. Toward that end, Torregiani might compete in Italy or Portugal in 2012. "The sport of racing is huge in Europe. All of the best engines come from Italy," Patrizio Torregiani said. "We'd love to do one or two races in Italy. The level of competition makes everybody a better driver." Only time will tell how far Tazio Torregiani will take his dream. "My ultimate goal is to get to professional car racing," Tazio said. "Right now, I know I have time on my side. I'll keep working hard and see what will happen."